Eyelet & Hole Punch Set~ This set comes with 6 bits. There are 3 hollow hole punch bits to create your hole-2mm; 3 mm & 4 mm in size. There are 3 coordinating setting bits for setting eyelets. Easy to use, they just screw into metal handle provided. 1/8", 5/32", 3/16", 7/32", 1/4", 5/16". To use, just position where you desire hole to be and hit the top with a hammer. Shape Punch Set~ Set of 8 creative punches to make holes for bookmaking or paper crafts. Set includes heart shape, rectangle, square, flower, star, 3/16" circle, 1/8" circle and 1/16" circle. This should cover all your hole making needs. Easy to use, the assorted tips screw in handle. Dual End Spatula~ This is a perfect tool for applying adhesives or other media to a tight spot (like in book making) or to smooth out over a surface. One end the flexible spatula measures approx. 1 3//4" long and the other flexible spatula end measures approx. 1 1/8" long. The wood handle is comfortable to use in your hand also. Metal Awl~ That's the technical term, or call it a hole reamer. It measures 6" long and the reaming tip seems to be quite strong. Use it for book board, chip board, fabric, paper, clay, etc. Grab & Stab Set~ I have found this to be a handy little tool. It has a sharp, pointed tip at one end and the opposite end has a plastic tip. The slimmer style would make it difficult to use as an awl, but you could easily adapt your own handle to use it as an awl. Great for picking up smaller items...paper, clay, etc. Set of 2. Eyelet Setting Tool 4 Pc. Kit~Heavy duty set for setting 1/8"; 5/32"; 3/16" & 1/4". Should easily meet all your eyelet setting needs. 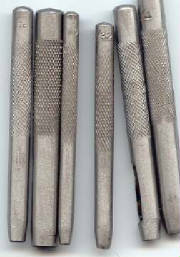 Button Shank Nippers~You can stretch your embelllishment options with these professional quality 4 1/2" end nippers. Use them to cut off button hanks and then glue the flat backed buttons to your work. They are also great for cutting wire. They are made of heat treated steel, sturdy spring load action, precision machined jaws. They also have a limited lifetime warranty from the mfg. Bent Nose Tweezers~ when you absolutely need precision placement, delicate paper picked up or a dainty little object moved, this is your tool. Stainless steel. It is so nice to have the right tool on hand when you need it.